Colleen: D.J. and George were two young puppies out of a very exciting litter. D.J. 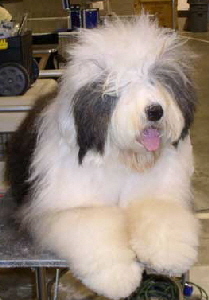 was the stylish one and I was worried that he might not mature into a “doggy” dog. Boy, was I wrong! He developed into a very masculine male with lovely style and carriage. Since George started his show career at six months, D.J. was shaved and we waited for his adult coat to come in. 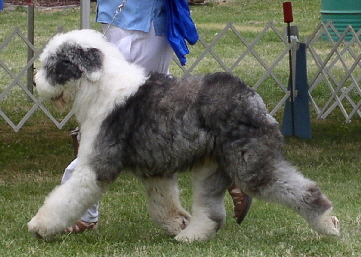 Once he matured, he competed with George and easily finished his championship. We campaigned D.J. as a special in 2006-2007 and D.J. won many, many group placements. We sent D.J. to Canada, to visit our good friends Dave Haddon and Betty Fast (Blue Caleb OES), to obtain his Canadian Championship. He certainly made an impression with the judges with four wins including three BOB, a Group II, a Group I, and a Reserve BIS, all on his first weekend of shows. 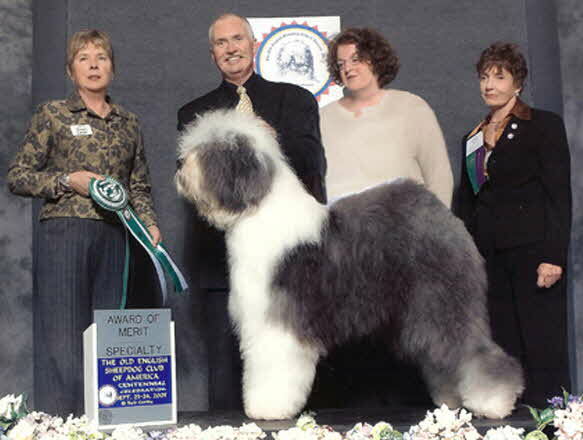 Dave and Betty brought him to the OESCA Centennial where he took an Award of Merit under breeder judge Terry Carter. D.J. won the Canadian National Specialty! 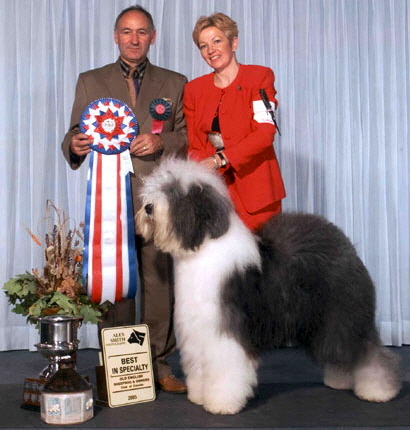 He was awarded BISS under Ray Owens, of England’s Amblegait Kennels. In addition to his lovely outline, D.J. has a very balanced, easy side gait and is true coming and going. He has passed this trait on to many of his offspring.